A weather map shows expected temperatures across the United States on the morning of Jan. 30. 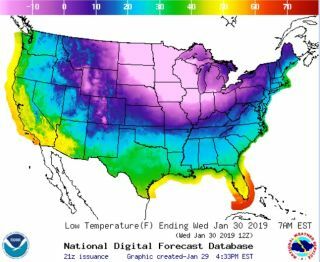 The polar vortex has returned to the United States, bringing "historic" cold and wind chills to a region spanning much of the Upper Midwest and the Dakotas. Temperatures close to minus 30 degrees Fahrenheit (minus 34 degrees Celsius) are possible in the Twin Cities region today (Jan. 29) and tomorrow (Jan. 30), according to the National Weather Service. That's comparable to winter conditions at the North Pole, and a bit warmer than the current forecast at the South Pole, where temperatures around minus 20 F (minus 29 C) are expected for the next few days. "I'm sure everyone is familiar with the polar vortex," said Tyler Hasenstein, a meteorologist at the National Weather Service Forecast Office in Minnesota's Twin Cities region. Hasenstein is referring to the body of supercold air that, under normal circumstances, stays locked up in the Arctic, turning endless circles around the North Pole. But this past weekend, a low-pressure storm system that moved through the Great Lakes region cleared a path for the vortex to escape southward, Hasenstein told Live Science. And the frigid air will be locked in place for the next few days thanks to "very strong system of high pressure" north and west of the arctic air mass, he said. The particularly intense cold in a wide region around Minneapolis has to do with the particular shape of the jet stream at the moment, Hasenstein said, which is delivering even more cold air into this area.Making matters worse, that high-pressure mass is interacting with the arctic air to produce high winds that make the already dangerously low temperatures even worse for people outdoors, he said. Wind chills as low as minus 60 F (minus 51 C) have already been reported in North Dakota, according to the local NWS. Being outside on a minus 30 F day with an additional minus30 F of wind chill isn't quite the same thing as being out in true minus 60 F weather, Hasenstein noted. But it's similar enough, and extremely dangerous, because the wind strips away the natural insulating layer of heat on the outside of a human body. "In terms of frostbite, if you're out in minus 25 degrees with no wind you can get frostbite in about 5 to 10 minutes, probably closer to the 5-minute end," he said. "But if you're out in minus 25 degrees with another 25 of wind chill, you can expect frostbite in under 5 minutes.". Hasenstein also said that people should know that their otherwise-working cars might fail in this weather. "It can be quite dangerous for vehicles that have been sitting out," he said, "Especially if they're not properly maintained or are toward the end of when they'd be getting their next oil change or something of that nature." Engines can fail, tire pressures can drop, and other problems can occur that would leave motorists stranded in the extreme cold. "The biggest thing for people to know is that if you absolutely have to be outside keep it as short as possible and try not to have any exposed skin. And that includes especially your nose and ears, as well as any extremities, [such as] your fingers and toes," he said. As scientist Michael Mann previously wrote in an op-ed for Live Science, there's a growing body of evidence to suggest that events like this are going to be more common as climate change makes the jet stream wander more wildly.